I know regular readers must be tired of the praise I heap on Broadway Records. I know my wife is. But, in the current age of throw away media, and all you can consume music, they are a phenomenon. No one else, not a major label nor a small independent is regularly turning out such a vast diversity of releases, at such a pace, and with such quality. And thinking back, I can’t think of any other label, other than perhaps TER/JAY and First Night who has done more for modern musical theatre. Their latest release arrived this week, and I was eager to see what was in store. 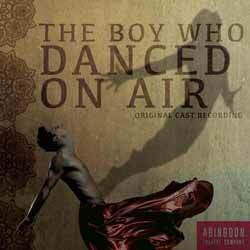 The Boy Who Danced on Air is a modern-day love story set in rural Afghanistan. Paiman and Feda have spent their young lives as dancers in the world of bacha bazi, where wealthy men take in boys from poor families, train them to dance at parties, and often abuse them. The two boys’ chance meeting changes the course of their lives and sets them on a journey to find their independence in this musical fable about love, tradition, morality and the strength of the human spirit. Written by Tim Rosser (music and orchestrations) and Charlie Sohne (book and lyrics), the show premiered at The Abingdon Theater, and this recording captures the original cast, which includes Osh Ghanimah, Troy Iwata, Deven Kolluri, Jonathan Raviv, Nikhil Saboo and Shiv Pai. The album features a bonus track by four-time Grammy Award winner India.Arie. I hadn’t come across the composers before, but they are winners of the 2015 Jonathan Larson Award, ASCAP’s 2015 Mary Rodgers/Lorenz Hart Award and the 2016 San Diego Critics Circle Award for Outstanding Original Score. Their songs have been seen at their sold-out 54 Below show, Birdland, Contemporary Classics at Seattle Rep, Cutting Edge Composers at Joe’s Pub, ALNM at Rockwell in Los Angeles, Above The Arts in London, a sold out show at Broadway au Carre in Paris, and the Kennedy Center in Washington, DC. So, quite a pedigree already. I can only describe this release as a feast for the ears. It’s rich, ethnic textures complement the soaring melodies perfectly, and the atmospheric sound the album has is a great listen. There are a variety of spine-tingle moments in this score, none more than 'I Know How You Feel' - just a wonderful mix of orchestration and words to create magic. 'Play Your Part' is also a great number that is simple, but effective - like much of the album. The bonus track is another highlight of the score, and is a fitting end to the release. It goes without saying the packaging, artwork and production are up to Broadway Records usual high standard.